Nissana��s all-new crossover blazes through Brazil in a historic Olympic torch relay. In the months leading up to the Olympics, the torch relay witnessed athletes like Jean Padilha, the table tennis player, who will participate in the 2016 Rio Paralympics join in as a torchbearer and move forward on a wheelchair. As Padilha keeps the flame hoisted, behind him, you can spot the sharp, V-shaped strips of light sneering at you. The light belongs to the LED headlamps of theA� Kicks, the newest sub-4 metre SUV from Nissan. The crossover features in the Japanese carmakera��s 40-vehicle strong fleet accompanying the torchbearers along the country-wide route in Brazil. Now on its return journey after touching the southern most point of Brazil, the torch relay will end at the opening ceremony of the Olympic Games at Rio de Janeiro on August 5. Over the course of the journey, the convoy has travelled through diverse landscapes of the South American countrya��from the dense rainforests of the Amazon, to theA� tropical wetlands of the Pantanal. Nissan deems this historical journey a fitting showcase for the Nissan Kicks. Characterised by the blacked-out pillars and V-shaped grille, the beefy looking wheel-arches and the dumbbell-shaped air dams, the crossover commands a butch, powerful stance. Judging by the variety of terrain covered during the torch relay, the production car is expected to be one thata��s both a�?stylish and versatile,a�� as promised by the carmakers. 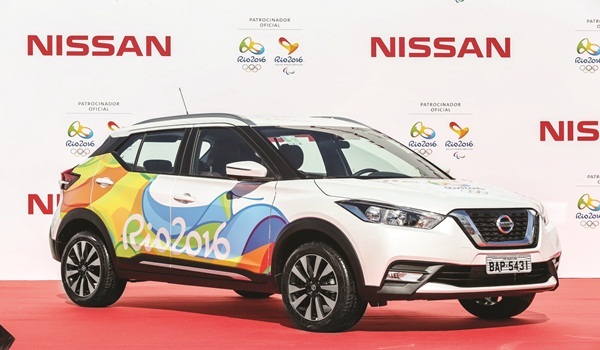 Besides the 40 cars in the relay fleet, Nissan will be exclusively providing 4,200 cars to serve as support vehicles during the Rio Olympics.